The last month and a half has been busy with non-visual art things like guests and cleaning and music gigs, but I did manage to start another painting. 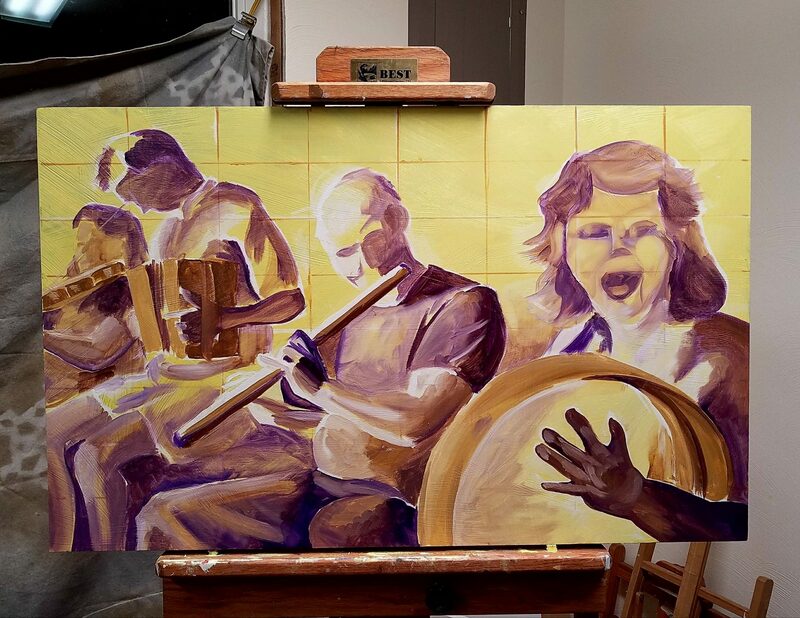 This one is on an old panel that I painted over with a titanium white/cad yellow mixture, and like the other fiddle painting, I started with a sort of purple and yellow grisaille (which is a nice contradiction in terms that should make some people twitch). Okay, so without the ‘gris’ (gray) it can’t be a grisaille, and with the bright yellow background it’s not even the purple version (a violetaille?). In fact, it’s only vaguely in the same neighborhood. My painting classes were “wing it until you’re stuck, then scream for help” rather than academic (at one point a classmate and I did literally scream, to see if that would get us more specific advice — it worked once the professor stopped laughing). Take my use of ‘real’ painting terms with a grain of salt. Odalisque in Grisaille by Jean Auguste Dominique Ingres or his workshop, from the Metropolitan Museum of Art. A true grisaille uses only grays, with occasional very subtle blushes of a single other color, but I’ve been using an intermediary hue. The solid yellow ground I’m using to paint up from is technically an imprimatura, but those are usually earth tones, not bright yellow. And most importantly, a true grisaille defines all the line, form, and detail of a painting. They’re so finished that they could be hung on the wall as-is. Classical painters use grisaille as stand-alone studies (study = practice, in art and in music, where they’re called ‘etudes’ because it sounds much fancier in French), as sketches in preparation for larger works, and as underpaintings. Classical painting over grisaille is often found in portraiture. The colors are added to the painting in transparent or semi-transparent washes, and the form and detail has already been supplied by the very refined grisaille. So we’ve established that my brightly colored, loose underpainting is more of a sketch than a grisaille, but it’s helping me in at least some of the same ways. With a very limited palette it’s easier to focus on form and light, because I’m not worrying about color. It gives a depth to the painting above it, because even if I’m using opaque or semi-transparent paints, there will be semi-transparent places due to mixing with medium — places where the pigment is physically thinner on the panel. It can be really subtle, but my exuberant color choices should set a tone for the whole painting. Painted on titanium white/cad yellow ground.